It's summer! And for this homeschool momma, that means a little break from our normal homeschool routine and a lot more time for fun activities! It also means planning ahead for the new school year. While I am still intentional about learning through the summer (my goal in homeschooling is to create life-long learners who seek out learning opportunities everywhere), we mostly reserve any of our "book-work" learning for the more traditional school year. Anyway, we are trying some new things this school year, ditching some old curriculums, and learning more and more about who our kids are, how they learn, how I like to teach, and what works for OUR family. 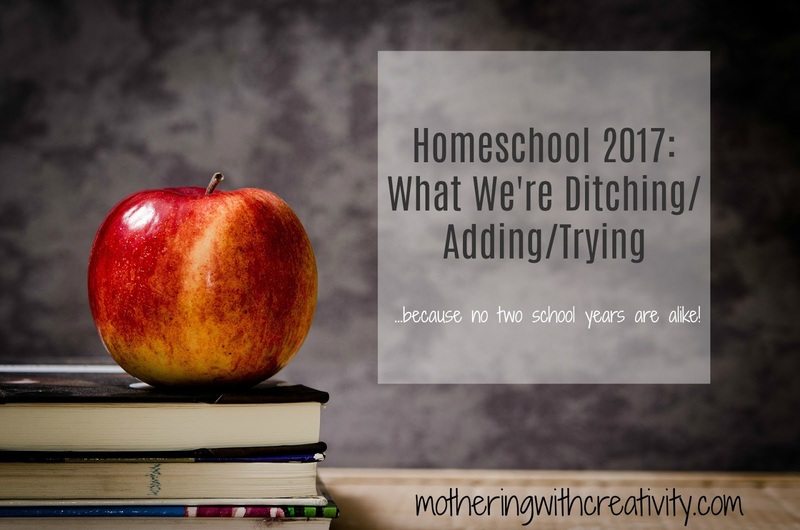 We are four years in (we've always homeschooled, and my oldest is now 9), and I feel like we get a little more comfortable and look a little more like "us" with each year of homeschool. We gave My Father's World: Exploring Cultures and Customs a try this year. I had heard many great things about this curriculum from friends, and so I gave it a try. I really liked that I could conquer many subjects all at once with kids of varying ages. This is how I had been operating anyway with our A Beka Science and History curriculums, so I figured having a resource that was intentionally designed this way would be helpful. Unfortunately, I honestly found the curricula itself hard to follow. I'm not sure what it was, but it was really challenging for me to sort it all out. HOWEVER, all of the books that go along with it were FABULOUS! Both my kids and I enjoyed reading aloud a good majority of the books that went with it. I decided that while the curriculum was not for us, we would reference and use some of the books that go along with it in the future since we enjoyed them so much. A Beka math has slowly been dying in our home. I really do like it for the younger grades, but it is just so intense at about the third grade level and on. Read below for more about why we're ditching this one and what we're trying instead. The further we get into homeschooling, the more I realize that I love Charlotte Mason style learning. We read aloud A LOT and tend to gravitate towards living books instead of text books. Half the time, I find myself crossing out tons of math problems in our A Beka program (because holy smokes...A Beka is crazy intense on the math end), and I want something that is set up in a way that meets both my kids' math needs AND doesn't make us feel like we were going crazy doing math all day. I stumbled across a Facebook review of a Charlotte Mason style math curriculum and it looked so enticing. After a little more research, I decided to jump in and give it a try this year. We are using Math Lessons for a Living Education by Master Books for all three big kids this year. Hopefully it works out well for all of us! This will actually be the first time not using A Beka for my younger grade kids. Tales2Go...technically, we added this last school year, but it was at the very end of the year, so I'm going to tack this on here. I was able to participate in a homeschool co op buy of Tales2Go, which is like an Audible type program (audio books). While it's typically $100/year, I was able to get it for $10/year in the group buy. And let me tell you, we already LOVE it. My girls listened to all six books in the American Girl doll series' for at least 6 different dolls. When they'd finish a series, we'd print some free lap books online and we'd review whatever was of interest for them-the time period in history, the culture, home life, etc. We studied WWII this way (the doll Molly is in the WWII time period), as well as immigration (Kirsten was a Swedish immigrant), and a variety of other topics. The best part? They listened to these books at bedtime as they were falling asleep. It was passive learning and didn't add any extra time to our school day. I'm excited to explore other books within the Tales2Go app and see how access to audio books transforms our homeschool. We will be returning to the A Beka History books this year. My oldest (9 1/2) simply LOVES history. And she really doesn't seem to mind textbook style learning for this subject. Since she enjoyed A Beka's history books in the past, I think we'll plan on adding these books back into our regular reading. We don't utilize the full curriculum (again, it's just not our learning style), but she loves to read through them and talk about it. Fifth grade A Beka history is ancient civilizations (she is already a few chapters in), which just so happens to be about the ONLY thing I ever found interesting about history when I was in school. I may be a little excited about this. Something I've learned over the years is that it's okay to not like a curriculum. It's okay to ditch something that isn't working, but it's also okay to hold out and see if it will just take some time. It's okay to love a program everyone else hates, or to be the odd one out when everyone seems to love a particular curriculum but you don't. Find what you love. Ditch what you don't. Change when you need to. Your kids will appreciate your flexibility in finding what works well for them, and you will be much happier when you are teaching in a way you both enjoy.